Oh boy, it's been a busy few weeks! I finally managed to get a few minutes today to look through and edit the photos from Halloween. I had planned on posting these about a week ago, but better late than never! 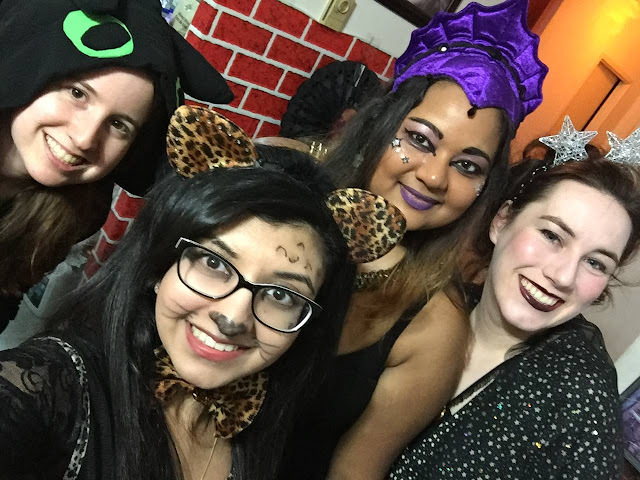 I had technically had three different costumes this year: one for a Halloween party, one for Halloween day, and then a third for handing out candy. This was a last minute costume for a party I attended the weekend before Halloween. I made a super quick cape and star crown, and threw it together with "starry" pieces from my wardrobe to complete the look. It was raining that night so a) I didn't get proper photos and b) my hair turned out a bit of a disaster. I quite liked the concept of this costume though, so it may be enhanced and re-worked for a future Halloween. I'm calling this one my "forest princess" costume for lack of a better name. There are plans to add some special effects to the photos so I may turn into more of a fairy or something magical, but for now "forest princess" is a more accurate description. 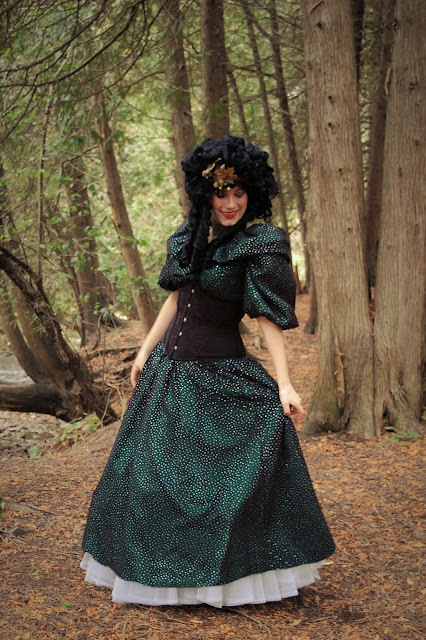 I definitely felt like a Disney character, albeit perhaps more of an evil step-sister than a heroine. The dress is a vintage one, which I've paired with a real corset to give it a bit more shape. Instead of a crown, I opted for a glittery headpiece of green leaves and baubles. I was also too lazy to curl my real hair, so I used it as an excuse to wear one of my many costume wigs that I use for photo-shoots. This one looked like 1920's style ringlets on the package photo, but in reality it's huge! Not really appropriate for it's intended purpose but it made a great vaguely 18th century wig when pinned up. Every princess needs a animal familiar! I was planning on wearing my princess costume all night, but after several hours in it I decided perhaps it wasn't the comfiest nor the most practical outfit. I took inspiration from Britt's fox costume and hopped into my Unicorn onesie for the rest of the night. It was definitely the best choice for knitting, movie watching, and handing out candy. And those were all my costume for this year! Hopefully I will get more time soon for more proper blogging and such.